New. Trade paperback (US). Glued binding. 444 p.
New. Sewn binding. Cloth over boards. With dust jacket. 176 p. Contains: Illustrations, black & white. New. 100% Money Back Guarantee. Brand New, Perfect Condition. We offer expedited shipping to all US locations. Over 3, 000, 000 happy customers. Sewn binding. Cloth over boards. With dust jacket. 176 p. Contains: Illustrations, black & white. A personal account of the Spanish Civil War..Orwell's experience as a militia man is written with passion and his account details clearly the chaos and cynical behaviour of the opposing factions fighting on the same side. His humanity is brought into question however, when he talks casually about taking pot shots, trying to kill his opponents in the opposing trenches..a first class political document of its time. Pretty quick postage, and the book is in good quality. Unfortunately the pages are slightly yellowed, but it's not too bad. Cheers! To me the first several chapters were boring. It got more interesting later in the book. The book's chapters had been rearranged which was not to the benefit of understanding --- the best being at the end. Beginning was boring static warfare while latter explained the political intrigue. Homage to Catalonia follows George Orwell?s time in Spain as a fighter in the Spanish Civil War. It keeps to a mostly chronological account, though his description of time spent in the trenches as militia fighter is rich and detailed, without enforcing a time-line on the events. Orwell went to Spain to write newspaper articles, but the urgency of the armed struggle led him to join an anti-Stalinist militia that fought against Franco?s fascist rebel army on the side of the Republican government. Anarchist, communist, socialist and liberal political parties and trade unions had formed a tentative alliance in the face of the fascist offensive, and Orwell arrived while this alliance was still barely-healthy. He went away to the front and returned to Barcelona when the conflicting ideologies within the Republican side were about to explode. The trade unions and peasants movements joined the war because there was a sense that while the fascists were being fought, democratic capitalism could be done away with as well. They were fighting the Revolution. The USSR-sponsored communist factions were actually anti-revolutionary, although none of this was clear to Orwell until later. When he arrived, Catalonia was an anarchist?s paradise, everything was collectivized and non-hierarchical: the workers ran the farms, cafés and factories. The militia he joined paid all soldiers equally, regardless of rank. Even rank was a weak concept, as soldiers were allowed to argue about orders until consensus was reached. 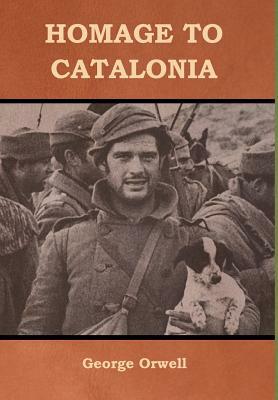 He describes in great detail the life conditions in the trenches of the Spanish war in Catalonia. The most forceful impressions left on me as a reader were mud, boredom, tobacco cravings and the quest for adequate weaponry, but never fear. Never rage. Orwell writes with such a cavalier attitude towards death that I never felt suspense or tension about his safety. He repeatedly refers to the terrible marksmanship of the soldiers on either side, and how this combined with the old weapons meant one was most likely to be hit by accident. This also impressed upon me his appreciation for the Spanish people: there was little malice, even in his description of Fascists or the anti-anarchist Communists. He saw that, as in his own life, it was mostly chance that defined where on the political spectrum any given person could come to fall. As he writes, a few months after the events described in the book, he is aware that during his time on the front it was the physical discomforts that occupied his mind, but they were not shaping his thinking. Although the fighting seemed like it would never resolve in favour of one group of the other, the time was of great importance to Orwell himself. He saw first hand the possibility of Socialism, and it struck with him ?with curios vividness? (p. 89). Orwell started writing for the love of language, but the events of his life eventually forced him to take on a political agenda. I am always interested in author?s reasoning for why they write. The most interesting works, to me, are those that were written out of compulsion, with the author being merely a vehicle through which the terrible, or beautiful battle that is going on in the soul can finally get out. I think that Orwell writes for this reason. The most powerful literary accomplishment of the book is the description of how Orwell himself was educated by his experience in Spain. He segregated a huge part of the explanation of the political landscape to two appendices at the end. Although initially included as early chapters, he felt not everyone would be interested in the political definitions of the events. Though initially I planned to write about how using this device was a bad decision, I now think it was justifiable. Orwell himself did not understand the intricacies of the events while he was living them, so to let the reader in on the political backroom dealings would affect their interpretation of the action. Ultimately, Orwell?s own experience in Spain was marked by his impressions of the Spanish people, of the trench warfare, of the human spirit. His descriptive work, therefore, was to achieve far more than his political narration. This is obvious by his choice of introduction. He describes the face of an Italian militiaman. ?It was the face of a man who would commit murder and throw away his life for a friend ? the kind of face you would expect in an Anarchist, but likely as not he was a Communist.? Orwell describes the face as having candour and ferocity, both very visual words. And yet, it was not important what his political stripe was. All sides were capable of the same honour. Orwell is clear that it was the authorities that sold out his military outfit and betrayed the Anarchists. He didn?t blame the soldiers. Although the reader at the beginning doesn?t know the difference between an anarchist or a communist, the fierce, proud face of the Italian stays with us throughout the story: he could be either, he could be both. Human beings are thrust into taking a political stance by the state of society around them, but they are not naturally this incompatible. They could be either, they could be both. Orwell's generosity to the human spirit is unlimited, and his account is a beautiful picture of war at it's worst and human's unnafected by ugliness around them.